This guide was originally published in March 2012. Since then, hundreds of students (and even non-students!) have created their own personal websites using it. As it is one of the most-viewed articles on College Info Geek, I keep this guide very up-to-date, and it’s current for January 2019. What’s the #1 networking tool you can have in your arsenal as a student? I’ll tell you this right now: it isn’t your resume. Resumes are boring. Career experts tell you to make your resume a one-page, size 11 Time New Roman document printed with black ink with no pictures. Seriously? How are you supposed to represent – and differentiate – yourself with that? Plus, your resume becomes static and outdated the moment you hand it to someone. You can’t update resumes you’ve already given out – you have to make new copies. That’s why you need to create a personal website. A website is the complete opposite of a resume. Everything bad about resumes can be fixed simply by having a website. I’d go as far as to say that not having a website is like shooting yourself in the foot – it’s that useful. 2) Having a website makes you more findable. If all you have is a resume, you have to go out and hand it to people to get your name out. If someone wanted to look you up on the internet and you didn’t have a website, all they might get is a Facebook or Twitter profile. However, if you have a website, you can be found by a much wider audience and control what it is they see first. This is key for establishing your personal brand and for highlighting your accomplishments. I’ve been offered jobs, met clients for my web design work, and gotten interviews simply because I have a website. If I didn’t take the time to create one, I’m confident that I wouldn’t have been found. Make sure you can be found! 3) Not many people have one. Personal websites may be more common in 2018 than they were ten years ago, but the vast majority of students and job seekers are still relying on resumes and job search websites. Succeeding today requires that you make yourself stand out, and having a website can help you do that. It shows that you’ve taken the time to learn how to do something fairly technical, and it shows that you have some skills other people don’t have. 4) You gain some new skills that can be very useful in the future. Learning how to build a website involves a number of different skills, especially if you get into customizing and optimizing things. Even if you’re not looking for a job in a tech field, having these skills can give you a leg up. Say you’re applying for a job in advertising. If you can tell the interviewer that you’re not only a great marketer, but that you also have knowledge of the web, you become a much more attractive candidate. I sure hope so, because this guide is going to teach you exactly how to build that awesome website! I spent over 15 hours writing this guide (as well as taking screenshots and editing them) with the intent of making it the ultimate resource for getting yourself online. When you’re done, you’ll have established a great online presence. The personal site and portfolio I used as a college student. My girlfriend Anna’s portfolio website – a good example to look at if you’re a graphic designer. 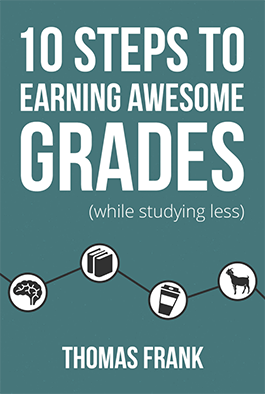 I’ve worked hard to make this guide as comprehensive, yet accessible as possible. It’s a bit of a long read, but that’s because it takes you from literally nothing to having a finished website. You can treat this list like a table of contents; if you’d like to jump to a specific section, just click it. Otherwise, feel free to truck through the whole guide in order. Photoshop, Dreamweaver, or any other program – these can be very useful for customizing things later down the road, but to get up and running all you’ll need is a web browser. Seriously, building a website isn’t hard and you don’t need to know any code. Knowing code can be useful for tweaking and customizing things later, but you can get the basics down without knowing so much as a lick of HTML! Estimated time to complete this tutorial: 1-2 hours (you’ll spend the most time on non-techy stuff like writing your content). Note #1: If you get stuck at any point in this tutorial and need help, I’d be more than happy to assist you. You can get in touch with me on Twitter or via email. I’m serious – please ask me questions if you get stuck. I’d hate to see anyone go through a bunch of work and not end up with a great-looking site. Alright, enough with the preliminary stuff. Let’s start building your site. The first step to building your personal site is to choose how you’re going to have it hosted. There are a number of ways to put up a website. For instance, you could just create a free blog at Weebly or WordPress.com, or even Tumblr. However, I believe it’s a lot more impressive to have a self-hosted site with an actual domain name (not a subdomain). This will look a lot more legitimate and will show that you’ve taken the time to learn how to actually build a website, which can differentiate you from the crowd. I can’t stress this enough: you need a good domain name. What makes a good domain name? For a personal website or portfolio, I’d recommend sticking to the following criteria. First, if it’s at all possible, make your domain name your first name + your last name.com. That’s seriously the best option for memorability and SEO (aka how high you show up in Google). If you have a common name (like I do), this will likely to taken already. I certainly couldn’t get thomasfrank.com, so I had to go with thomasjfrank.com instead. If your name is taken, you can throw in a middle initial or maybe even your full middle name if it doesn’t make the domain too long. You can also use a clever play on your name if none of the above works. For example, my Instagram username is TomFrankly – so I’ve also registered tomfrankly.com. Don’t use numbers in your domain name, and only use dashes if you absolutely must. There are also lots of weird new domain extensions these days, like .limo and .pizza – but my opinion is that going with a more established and recognizable extension will help you avoid confusing people. Above all, make sure your domain’s spelling is very easy to get correct for someone just sounding it out. This way, you’ll be able to mention your domain easily in casual conversation, and the person you’re talking to will be able to find it without worrying about the spelling. So once you’ve thought of a good domain name, let’s kick off this whole website-building process by getting your domain and hosting. Time to Get a Domain Name and Web Hosting. It used to be that you had to buy your domain name separately from your web hosting. Now, however, you can get them from the same place, right at the same time. Buying them separately is still an option, but it’s so much easier to get them together. I’m going to use the combined method in this tutorial to keep things simple; however, you can always get in touch with me if you want help setting them up separately (or for anything else). Note to your wallet: this is the only part of the process that will cost you any money. Hosting isn’t free. However, it doesn’t have to be that costly, either – and I believe the small cost is worth the boost having a website gives to your personal brand and credibility. There are literally a zillion options for web hosting out there. You can go with a shared account, a VPS, or go crazy and pay for your own dedicated server. You could even get geeky and host your site from your own computer – though I don’t recommend this as you probably don’t want to deal with the security risks of running a web server, and any time your computer gets turned off (e.g. during power failures and when you have to move out of your dorm), your site will go down. Still, it’s an option. One time, I needed an obscure PHP server setting changed for a school project, and it was something their level-1 techs couldn’t do for me. So within 20 minutes of me asking, one of their higher-up system admins not only changed the setting, but also sent me a screenshot of the directories and commands he used to do it just in case I needed to do it on another server in the future. HostGator, my web host of choice. You can also get a pretty good discount. Since I’ve been with them for several years and am directing this tutorial at budget-conscious students, I asked if I could partner with them to offer a discount. They said yes, which is why you’ll see my bearded mug on the page when you click through. So, use the coupon code COLLEGEINFOGEEK to get 50% off of your initial hosting purchase (or even 62% off if you choose a 3-year plan). So yeah. This tutorial assumes you are using HostGator; however, if you choose another host, these instructions should be pretty similar to what you need to do. Start your journey through the order wizard by picking out a domain name. Assuming you don’t already own one, stick with default tab Register a new domain, and type the one you’d like to see if it’s available. If it is, you’ll see a screen like the one below! If not, tweak it a bit until you find one that hasn’t been taken. Beneath all the domain extension options, you’ll see an option for adding domain privacy protection. This is a service that prevents your name, address, and phone number from coming up in WHOIS searches. Most people don’t know about WHOIS, and it used to be the case that you could get away with not having it. Today, however, spammers like to write bots that search the WHOIS database for new domains and then send spam emails to the people who registered them. The Domain Privacy Protection option. As a result, domain privacy protection is something that I recommend adding. However, it’s also an option you can add to your account later on, so if you don’t do it now (or you already signed up and forgot to include it), you’re not out of luck. Hatchling plan should be selected. I recommend getting at least a year. Other than that, though, you can leave all the other boxes unchecked to save yourself some money. In the section on Plugins, I’ll show you some ways you can keep your site secure, backed up regularly, and more likely to show up highly in Google search results (or “optimized for SEO” as we web geeks like to say) – all for free. Hosting add-ons. I don’t think you really need any of these, other than SSL – which is pre-checked, and free! Lastly, hit the big yellow button to create your account. Once you’ve paid, you’ll receive an email that contains “Your Account Info” in the subject link – that’ll have all the information you’ll need to continue. Time to start actually building your site. As I mentioned in the beginning, you’ll be using a tool called WordPress (self-hosted, not WordPress.com) to set up your site. You may have heard that WordPress is mainly a blogging platform, which is completely true. However, in recent years WordPress has become so popular and well-supported that it makes a perfect platform for building non-blog sites as well. WordPress is famous for only taking 5 minutes to install; I say that’s way too long. Let’s do it in 2, shall we? One of the best things about HostGator is their quick-install options for almost every popular CMS (Content Management System). Of course, they have one for WordPress. Let’s get it set up. To start, type this URL into your browser (but replace “yourcoolnewdomain” with your website’s domain name): yourcoolnewdomain.com/cpanel. Log in with the username and password you were given in the email. You’ll now be looking at your control panel. To install WordPress, look in the “Essentials” section and find the link for WordPress Installer. WordPress Installer – a tool that will help you automatically install WordPress in seconds. On the page that comes up, select your domain name from the drop-down menu. It should be the only option listed. Make sure you leave the directory field blank – that way, your homepage will be set to your domain (i.e. yourcoolnewdomain.com) instead of a sub-folder. Choose a Blog Title. If you’re creating a personal website, use your name. This can be changed later. Enter your first and last name – these can also be changed later if needed. Enter an Admin Email. Make sure it’s one you use. Check both of the boxes beneath the text fields. Once you’ve done that, you should see a big green check mark and the words “Installation Complete”. You should also see a section titled Installation Details. Here’s you’ll find your WordPress username and a generated password. Make sure you store these for future reference. Find your WordPress username and password here. Below your installation details, you’ll see some offers for premium themes you can use. I’d recommend skipping over these – I’ll point you to some awesome free themes later in this guide. In fact, my own personal website is built on a free theme. You should now have a fully functioning WordPress installation! If you visit your site right now, you’ll see a “Website Coming Soon” page – which will go away and be replaced by your new website once you log into the WordPress Dashboard and launch it. To get to the Dashboard, type yourcoolnewdomain.com/wp-admin into your browser – this is where you’ll do everything else related to building/customizing your site. It’d probably be a good idea to bookmark that link! Add “/wp-admin” to your domain to reach the WordPress Dashboard. Note: It can sometimes take up to an hour for the web host to set up your account. While you’ll be able to access your cPanel right away, your domain might not be accessible for that hour or so. You can read more about this here. Normally, WordPress doesn’t do any hand-holding; once you log into the Dashboard, you’ve got access to all the tools and it’s up to you to figure out what they all do. However, the version of WordPress that HostGator’s cPanel script installs comes with a short wizard that can guide you through the process of setting a few things up. But we aren’t going to use it. To get started, hit the “I don’t need help” link beneath the Business and Personal buttons. Click “I don’t need help” – we’re going to do this manually so you understand every step. Next, we’re going to take a minute to clean house. Along with the wizard, HostGator’s version of WordPress comes pre-installed with a few plugins that you either don’t need, or that are inferior to the ones I’ll recommend a little later in the guide. Let’s get rid of them in order to keep things simple and clean. On the left side of the Dashboard click Plugins. Check the box next to Jetpack by WordPress.com, MOJO Marketplace, and OptinMonster API. Click the drop-down menu labeled “Bulk Actions” and select Deactivate. Hit Apply. Now, check the box next to all the plugins – except Akismet. Click the Bulk Actions drop-down once again and select Delete. Hit Apply. What’s Akismet, you ask? Akismet is a plugin that helps keep blog comment sections free of spam. If you decide to add a blog to your website (which is really easy with WordPress), and you’d like to enable comments on your posts, Akismet will come in handy. If not, you can always come back later and delete it. Before adding any content to your site, you’re going to want to go through the quick process of activating your site’s free SSL certificate. Doing this will ensure that visitors automatically end up at the secure “https://yourcoolnewdomain.com” rather than the insecure “http://yourcoolnewdomain.com”. If this difference means nothing to you, well… all you need to know is that doing so makes your site appear more trustworthy and safe. For example, if you look up in the address bar for this site, you’re probably going to see either a lock icon, or the word “Secure” next to my site’s URL. That’s there because I have an active SSL certificate for my site. Without that, the address bar would say, “Not Secure”. If you care to know any more about this, check out Google’s article on why HTTPS matters. Fortunately, HostGator includes a free SSL certificate with your account, so all you need to do is activate it on your WordPress site. And – even more fortunately – that’s really easy to do, as long as you do it before adding any content to your site. Search for Really Simple SSL. This is a plugin that will automatically enable SSL on your site. Install the plugin, activate it, and then click the button that comes up afterwards in order to fully activate SSL. The Really Simple SSL plugin. Now, before we get our hands dirty with the business of creating pages and all that, let’s take a few minutes to get a feel for the WordPress Dashboard. WordPress is a system that’s pretty easy to use and navigate. However, I’d still like to give you a quick overview of what’s available to you. The big welcome message in the middle is there to help you while you’re first getting started, so it’s good to check it out. Beneath this message are a bunch of widgets, but you won’t need to do much with them right now. What I’d like to go over are the links in the sidebar – these are all the core functions of WordPress. Note that hovering over each of these links will cause additional options to show up. Also, the one that’s active will show its additional options by default right underneath it. Media – a central repository for any pictures, sound files, video, and other pieces of media that you upload to your site. Here you can browse through and edit media you’ve uploaded to your posts and upload even more. Comments – here you can see the comments on your blog (if you decide to have one). Appearance – this is where you’ll customize the look and feel of your site. There are options for your site’s theme, menus, and the widgets you want to display. There’s also a rudimentary code editor, but it’s not very good. If you’re getting to the point where you want to manually edit your site’s theme, I recommend CodeAnywhere. Plugins – this is where you can add and manage your plugins, which are like small apps that can give your site new functionality. There are a number of great plugins you should be using, but we’ll get to those a little later. Users – here you can manage the user profiles on your site. Since this is a personal site, the only one that should be here is your own. Tools – by default, the only things here are the Import/Export options, the Press This bookmarklet, and a Categories/Tags converter. Right now, you won’t need any of these. Before you start making your pages, however, let’s take care of a couple important things! 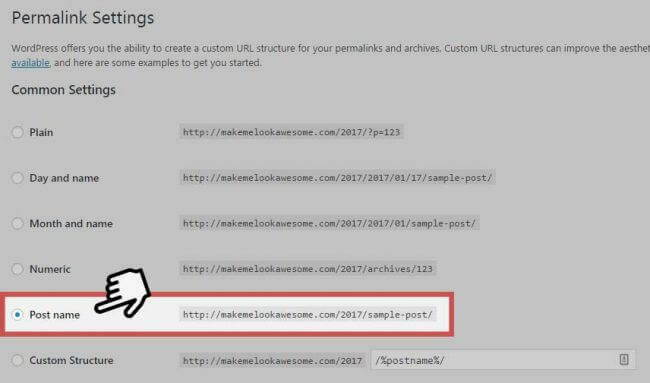 When you create a page, WordPress makes the URL reflect the page title. For example, a page titled “Contact” would get a URL like yourcoolnewdomain.com/contact. This is what you want. However, by default WordPress doesn’t do this for blog posts. Instead, it creates these ugly numeric URLs like yourcoolnewdomain.com/?p=123. These URLs don’t mean anything – it’s much better to make your blog post title be the URL. Hover over Settings and click Permalinks. Choose the option for Post Name. Now your blog post URLs will be much more memorable. Now that you’re done taking care of that little detail, it’s time to create your pages and get your content up on the web! If you recall from the section detailing each part of WordPress, Pages are used for timeless content such as your biography and contact information. These pages will appear in your site’s top-level navigation, or 2nd-level navigation if you decide to create child pages. My current site’s main menu. The main menu on my previous website. This is up to you, but what you should keep in mind when deciding is that your site’s #1 job is to showcase your work and expertise. The better it does that, the more likely people are going to want to hire you or work with you. When I was a student, however, my priority was to get hired. As a result, going with a multi-page design gave me a way to give potential employers a one-stop shop to see my resume, bio, and a detailed look at my best work. So ask yourself – What’s my website’s purpose? Who is the intended audience? Use that information to guide your decision. If you’re a student, it’s likely that your main priority is getting hired or selected for scholarships/research opportunities/etc. I think a multi-page design works best for those purposes. In the end, though, it’s your choice! A Contact page that tells people how they can get in touch with you. It might have a contact form as well. Note: I don’t recommend publicly listing your email address, phone number, or physical address on your site – spammers can easily grab that info. A contact form, along with links to your social profiles, is a much better option. A Portfolio to show off any kind of work you’ve done – graphic design, programming projects, writing – whatever. On my previous site, I created a portfolio of my web work using a normal page template. You can make yours this way, or you can get a theme with a specific portfolio template. Check out my girlfriend Anna’s site for an example. A Hire Me page. I strongly suggest you make this page, even if you aren’t currently looking for full-time work or freelance gigs. This page tells people what you’re looking to do, and can help them picture where you’d fit better. A Press page, where you can list any interviews or mentions you’ve gotten in the media. Check out my Press/Media page for an example. An Impossible List. I think creating a page like this is really fun, and can help you solidify your life goals. It’s really up to you to decide what pages you want to have on your site. I’m going to show you how to create your About Me page, and you can use the same steps to create the rest. Before you do that, though, you should delete the sample page and post that WordPress automatically puts up on your site. First, get rid of the sample post by going to Posts on the WordPress Dashboard. Find the post titled “Hello World!” and click Trash. Then go to Pages and do the same thing for the page titled Sample Page. Your About Me page will be the landing page of your site – the place visitors will see first. Here you’ll want to have a short summary of who you are, what you’re studying, and the what work you do. It’s also good to have a picture of yourself, and maybe even some quotes about your work from other people. As you can see, creating pages in WordPress is pretty easy. To get your About Me page started, first enter a title in the Title Bar. It would probably make sense to title this page “About Me” or “About <your name>”. Next, you’ll find the body area. In most cases, you’d use this space to enter your content. However, depending on the theme you choose (more on that in the next step), you might be entering your content somewhere else – so for now, just enter a sample sentence or two. Take a look at the different tools available for formatting your content; as you’ll find out, using WordPress isn’t all that different from using Microsoft Word. Most of these tools will allow you to format your text, add links, and so on. You can also use the Add Media button to upload a photo and add it into your post. One of these is me. Boom – you’ve got a photo on your page. So once you’ve got your photo and some text, go ahead and hit Publish. This will make your page go live. 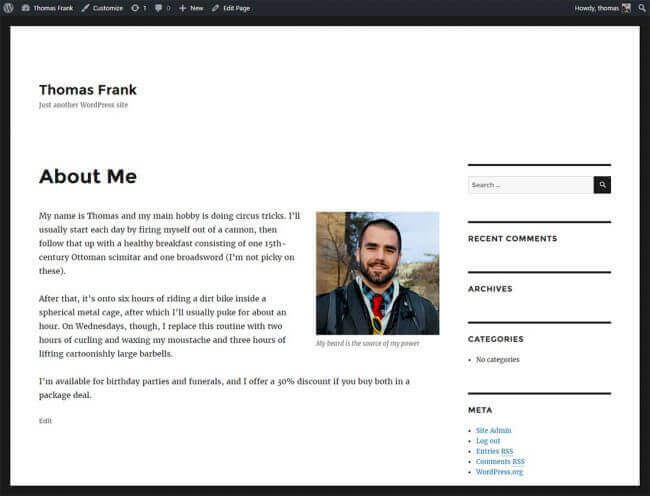 How your page will look with WordPress’ current default theme. However, WordPress will show you blog section as the homepage by default rather than this page. In the sidebar, hover over Settings and click Reading. Choose your About Me page to be the home page. If you want to have a blog, create and publish a blank page called Blog and set it as the Posts Page. Now, go back the the Pages section of WordPress and create the rest of your pages. This process should be relatively straightforward; the only one that may be more complicated is your Contact page. This page can be really easy to create if all you want to do is link to your social media profiles. However, you may also want to link your email address or add in a contact form. Making your email address clickable is really easy – just highlight any piece of text (I’ve actually typed out the [fake] email in this example, but you can use any text), click the Link icon (or hit CTRL/CMD+K) and type “mailto:[email protected]” without the quotes. However, do note that making your email address public enables anyone to send emails to it – even spammers and bots. This is why I prefer using a contact form instead. If you decide you want to add in a contact form, you have two options. You can either find a theme that has a built-in contact page template, or you can use whatever theme you want and add a contact form using a plugin. Either way, it’s really easy. I’ll cover the first option in Step 3 and the second in Step 4. If you’d like to add a blog page to your site, it’s ridiculously easy. Simply make another new page on site called “Blog” (or whatever you want, it doesn’t matter). Then on your Dashboard go back to Settings -> Reading and set your Posts page as that page you just created. From there, all you have to do is go to Posts and start writing. All your published blog posts should show up on that Blog page. If you’d like to learn more about creating a successful blog, then be sure to check out my comprehensive blog-building guide. At this point, you should have all your pages set up, assuming you’re going with a multi-page setup. Now it’s time to make sure visitors are impressed when they hit your site. Let’s look at customizing your site’s look and feel. One of the best things about WordPress is the stupidly large amount of themes available for you to use. Using a theme, you can change the look of your site without needing to know any CSS or have any graphic design skills. A theme is basically a template or skin for your site. It changes the look while retaining all the content you created. The first step in customizing your site’s look is to simply find a theme you like. This can be easier said than done, due to the huge amount of themes out there. I’m going to try and help you pick one out. I’ve gone out and found four WordPress themes that I think work well for personal sites. Keep in mind that there are literally thousands of themes out there, so this is just a starting point. This is the theme I’m using on my personal website. It’s incredibly versatile, as it’s a builder-style theme that lets you customize each page to a huge degree. Also, it’s free. In addition to the tutorial, you can also check out the official documentation for more answers to questions you might have. Verbosa is another great free theme that gives you a lot of room for customizing the look an feel. It’s not a builder-style theme, so you can’t edit the structure as much as you can with Simple, but you do have a lot of other options. In my opinion, Verbosa is easier to learn than Simple, which is a fair trade-off for its lower level of flexibility. Check out the theme’s homepage for updates and documentation. 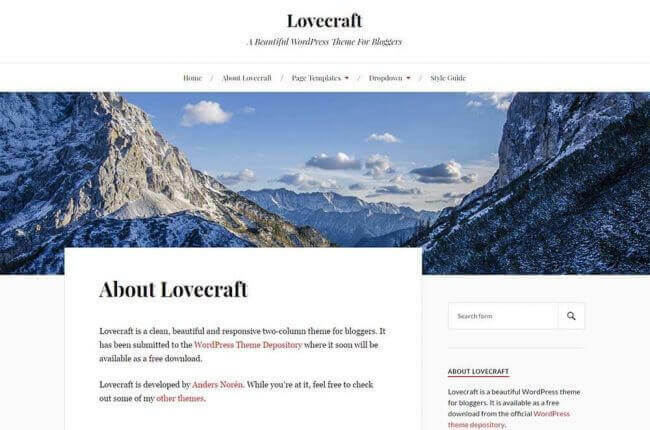 Lovecraft is, by admission, a theme for bloggers – but with its great typography, clean menu, and large image area, you could also use it to make a great-looking personal website. Unlike the previous three themes I’ve listed here, Ultra is a premium theme. That means it costs money – around $50 as I write this. So why pay for a theme when there are so many free ones out there? Simply put, it’s flexibility. Ultra is a theme made by Themify – the same people who made Simple, which is the free theme I mentioned above. While Simple is indeed very flexible – especially for a free theme – Ultra takes things up a notch. For instance, Ultra includes 15 different header styles, which means you can put your logo and menu items wherever you want. You also have a lot more choice when it comes to colors, fonts, and pre-built page layouts. Additionally, there’s a portfolio feature that lets you easily showcase your work. Like I said, the theme options you have are literally endless. Explore and find something you like! Also, see if the theme you’ve chosen has a template for a contact page. If it does, you’ll be able to put up a contact form without using a plugin. Once you’ve found something that you like well enough, let’s get it installed. Wherever you found your theme, download it to your computer. The theme will probably come in a .zip file. Look inside this zip file. If you see files like index.php, header.php, and footer.php in that very first folder, you’re good. If you find that those files are buried in sub folders, you’ll need extract everything and create a zip folder of whatever folder contains those files. Most themes will come with documentation that tells you how or even if you need to do this, so consult that for help if you need it. Once you have the final .zip file, it’s time to install it. On the WordPress Dashboard, hover over Appearance and click Themes. Click the tab at the top that says Install Themes. Find and click the link that says Upload. Choose your .zip file and and click Install Now. Make sure the theme was installed successfully, and click Activate. From this point forward, I can’t really cover theme setup in this tutorial. Themes are so diverse that it’d just be impossible for me to cover everything. Luckily, most good themes come with documentation that will walk you through setting them up. Almost every WordPress theme out there will give you some options for customizing your site’s logo, colors, and other features. Some themes might come bundled with special menu areas in the Dashboard for certain settings, but most of your customizing will be done at the built-in WordPress Customize Tool. To access it, hover over Appearance, then click Customize. Once you’ve opened the tool, you’ll see a live preview of your site, along with a number of options on the left. Every theme will include different options, so you’ll have to play around with it yourself to see what’s possible with the theme you’ve chosen. Here, I’ve changed my site’s logo using the Customize tool. Once you’ve made all of your changes, click Save & Publish at the top of the menu to make your changes live. Remember: Depending on your theme, the Customize Tool might not be the only area where you can make changes! For example, the theme I’m using on my personal website, Simple (linked above), features an entire page builder tool that can be accessed on every page. Always make sure to check out the documentation for your theme so you know what all your options are. One thing I’ll go over before we head into the next section: WordPress’ Custom Menu functionality. Ask, and ye shall receive. I’ve created a short video that will guide you through the whole process of creating a custom menu for your site. Now that you’ve got your theme, it’s time to tweak things a little bit further by adding plugins and widgets. Alone, WordPress is a great system with a lot of functionality. However, the true beauty of WordPress lies in its ability to work with plugins – small (or large) pieces of packaged code that add functionality to your site. There are a few plugins that I believe are absolutely essential to any WordPress site, and more still that you may want to install as well. On the WordPress Dashboard, hover over Plugins and click Add New. Search for the plugin you want. The search function isn’t amazing, so you’ll usually get the best results by typing in the exact name of the plugin you’re searching for. Click Details to read about the plugin or Install Now to install it. After you install, click Activate. If there’s any setup required for the plugin, take care of it. Important Note: Plugins work directly with the guts of your WordPress installation. It’s important that you be discerning on what plugins you choose to install on your blog; make sure you trust what you’re installing. I recommend looking up plugins at the WordPress Plugin Directory before installing them. If a plugin has a low star rating, it might be broken – or even worse, it could have security vulnerabilities that can open up your blog to attacks. Be careful out there, trooper. There are a few plugins that I wouldn’t be caught dead without on these high seas of the Internet. I recommend you use them as well. I’ll link to each one’s repository page, but remember that you can install them directly from your Dashboard just by searching. Ninja Forms – a simple, easy-to-use contact form plugin. Check out the documentation for instructions on how to get everything set up. WP Super Cache – simply put, this plugin will make your site load a lot faster for your visitors. By default, WordPress pulls information from its database each time a visitor loads a page. This plugin will “cache” a lot of that information, letting it be loaded really quickly without the need for a database call. UpdraftPlus – probably the best free site backup plugin I’ve seen. Lets you manually back up your database or your entire site. You can also set regular, scheduled backups (which I recommend), and send them off to remote destinations like Dropbox, Amazon S3, email, etc. These plugins are just the tip of the iceberg. If there’s something you want to do with your site, there’s probably a plugin that can help you do it. Alright, now that you’ve got your plugins installed, let’s move on to the final bit – widgets. Widgets are elements that you can place on any part of your theme that has been “widgetized” – that is, set up for widgets to display. There are already a few widgets displaying on your site by default, like Category, Recent Posts, and Meta (though some themes might not display them everywhere). On the WordPress Dashboard, hover over Appearance and click on Widgets. On the right side of the screen, you’ll see all of the widget areas that have been created for your theme. Drag the widgets you want from the middle area into the correct boxes. Change any specific widget settings you need to change. Widgets are automatically saved when you drag them in or out of a box. By the way, you can use the Widget Context plugin if you want to specify certain pages that a widget will or won’t be displayed on. This keeps things from getting redundant. Links – if you have friends who also have personal sites, it can be cool to link to them. I did this on my previous personal site’s sidebar; it was a cool way to build a visual network of student entrepreneurs. Text – as it says, this is a widget for “arbitrary text or HTML”. You can put anything in this list, granted that you know a smidgen of code. For instance, you could add a picture of yourself and a super-short bio like I’ve done on this site. Or you can embed your tweets using Twitter’s Profile Widget. There are a lot of possibilities here. You should now have a fully functional website! You’ve got all your pages created, your menus set, an awesome theme, some great plugins, and a maybe a few widgets in your sidebar. Congratulations! You’ve just upped your internet cred +1000 and simultaneously made yourself a much more attractive candidate for any job you might want to go for. Most important: Add your URL to the top of your resume – and if you’re displaying any work on your site, consider labeling it “portfolio” so recruiters know to check it out. Add your URL to your other social networks – Facebook, Pinterest, LinkedIn, Google+, etc. Send me your new site’s URL on Twitter! I’d love to check it out and see what you were able to come up with. Alright, so for those of you who want to go above and beyond, let’s take the final step. The purpose of this tutorial was to get you from zero to having a working website as easily as possible. However, you can do so much more to optimize your site’s design, speed, SEO, security, navigation, typography… your options are endless. That’s why I want to show you some of the things you can do to take your site to the next level. I’ll also point you to some resources you can use to get started! The good news is that Google’s algorithm (as well as the algorithms of other search engines) has gotten much, much better over time. Its mission has always been to serve up the most relevant results for what a person searches, and it’s gotten pretty good at doing that. It’s also a lot faster at indexing new sites that pop up; when I started building websites, I remember having to manually submit them to search engines and then sometimes wait months to see them show up. Now, Google will index your site automatically – often in just a couple of days. Let’s start with your website’s content. The main way that Google figures out what’s on your site – and hence how relevant it is to a person’s search terms – is pretty simple: It reads your site! Google uses small pieces of code called spiders to “crawl” the content of the internet and index it. Clearly, the main thing you want to be associated with is your name. However, many people share the same name – in fact, I’m a prime example. I’m Thomas Frank, but Thomas Frank is also a well-known political author with several published books, bylines in high-profile websites and newspapers, and a Wikipedia entry. Until quite recently, his fame ensured that I didn’t show up anywhere on Google’s first page when you searched “Thomas Frank”! However… were you to search for “Thomas Frank YouTube” or “Thomas Frank college”, I did come up. Often first. That’s because I worked to associate myself with terms that describe my career, industry, and interests – and I made sure my website mentioned them. Notice that it lists author, YouTuber, and the words “students” and “college”. Google picks up on those terms and feeds them into its algorithm. They don’t guarantee that I’ll rank highly for them, but they help. What about your location? If you live in Portland and you’re hoping to land a job or a freelance gig locally, then you’d do well to list yourself as a “Portland-based graphic designer and illustrator”. The more competitive a search term is, the more authoritative links your site will need to rank for it. Ranking for “baseball” would be really hard, while ranking for “gorilla swallowing 18 baseballs” would be easier (and yes, I’d watch that). Social profiles – LinkedIn, Twitter, Goodreads, etc. I will note that many social media websites are set up in a way that doesn’t let a link on your profile directly boost your ranking; however, making sure to have it there can lead other people to it (since Twitter and LinkedIn have a lot more traffic than your website), and they may end up linking to it from other sites. If you want to go further, consider writing guest articles for sites in your industry or for your school newspaper. Links from those sites can help, especially if your name has a lot of competition like mine does! Lastly, I do want to mention that Google puts a high priority on mobile-friendliness. More than 50% of internet traffic now comes from cell phones and mobile devices, and Google has taken notice. Luckily, most good WordPress themes today are tuned for mobile responsiveness out of the box – meaning you probably won’t need to do much work to make sure your site is mobile friendly. Still, it wouldn’t hurt to check out your site on your phone after you’ve built it in order to ensure that it’s easy to navigate and read. I started building websites when I was 12. At first, I was just using the super-old school Geocities site building tool to drag and drop elements. It was fun, but it wasn’t enough. Eventually I found that I needed to learn some code, and I began teaching myself HTML. Luckily, the web has come really far in recent years. With content management systems like WordPress, anyone can make a beautiful website (as you just did) without knowing any code whatsoever. Still, clicking around WordPress can only get you so far. There comes a point where you want to take your site to the next level, and you’ll need some web development knowledge to do it. With that in mind, here are some resources you can use to kickstart your web development education. DevDocs – an amazing wiki chock-full of tutorials and references. If you’re a a reading-based learner, this is a great place to start. Mozilla Doc Center – another awesome place to learn the basics. I prefer the DevDocs, but this is a great alternative. Codecademy – a site that offers interactive courses on HTML, CSS, programming, and more. Definitely a good choice for those who learn by doing. Design Tuts – the place to go if you’re looking to brush up your graphic design skills. They’ve got lots and lots of great tutorials. Codecourse – an amazing channel to watch free video tutorials on all different kinds of coding languages, including PHP, which is what drives WordPress. 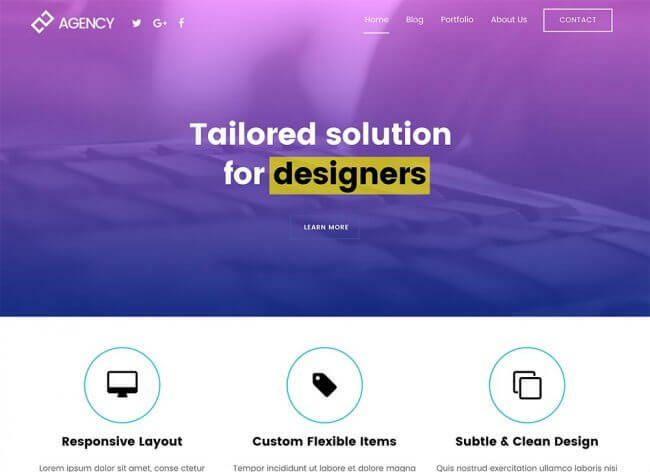 Web Design Tuts – part of the very large Tuts+ network ran by Envato. I’ve linked to one of their great beginners’ series. WordPress Codex – the official documentation of WordPress. There are a lot of great tutorials here, as well as a complete function reference for when you start getting really geeky. Smashing Magazine – an amazing online magazine with articles about every aspect of web development. One additional resource I recommend, but that isn’t free, is Lynda.com. This is an amazing site to hit up if you’re looking for video courses on literally any web development topic. In fact, many universities offer their students free subscriptions to this site. Ask your school’s IT department to find out if yours is one of them. HTML and CSS: Design and Build Websites by Jon Duckett – a beautiful book that provides a great introduction to the basics of web development. This is a great starting point to any web development education. WordPress 24-Hour Trainer by George Plumley – if you’re looking for a book for beginning WordPress. Honestly, I think you can learn well enough by using the Codex and just playing with things. If you really want a book, though, this is it. Professional WordPress: Design and Development by Hal Stern – for the serious geek only. This book digs deep into WordPress. Only buy this if you’re interested in learning how the Core and Loop work or how to start building themes and plugins. Don’t Make Me Think by Steve Krug – the kickstart guide to web usability. A great way to learn how to make websites usable and accessible. Web development education is a huge field, and I’m not going to pretend I can cover it all in one post. These resources will get you started, but know that there are lots of other great ones out there. One of the best ways to learn is simply talking to other developers! Now that I’ve gone through ways you can learn web development, I’ll round out this post with some links that will teach you specific things you can do to make your site even better. You might not feel the weight of that word, especially if you just browsed through this article first before getting started. For me, though, it’s amazing to look at after spending over 15 hours writing this tutorial. Hopefully, you now have a completely functional website and a budding knowledge and interest in web development. If you’ve gained either of those things, I’ve done my job! Remember, if you need any help, you can contact me. I’ll either help you directly or point you to people or resources that can be of assistance. You can also just connect with me on Twitter without a need for help – I’d love to meet you! You can also check out our list of 50 awesome personal website examples if you’re looking for ideas on how you can improve your own site even further. Did you find this tutorial useful? Want to give back a little? It only takes a second to share this post on Facebook or Twitter, and it helps other students find College Info Geek. Or, you can use the image to the right for sharing on Pinterest! Thanks!! !